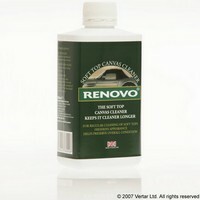 Renovo Soft Top Canvas Cleaner (500ml) is an effective liquid cleaner that will gently remove dirt, tree sap and bird droppings from all fabric tops and boat covers. I used the ultra proofer on my Blue Saab Soft top, I followed the easy instuctions and it worked a dream..
it looks like a brand new roof and the rain just beads and runs off after one 500ml coat, highly recommended. First of all, ordered "my stuff" on the Sunday and everything arrived Tuesday, superb service. Stage 2. Next I applied the canvas cleaner (and used the full 500ml) following the instructions, after leaving for 20 minutes, I returned and with a bucket of warm water and a bristle scrubbing brush, cleaned the whole top, what was amazing was that upon completion the top came up as new, I left it over night to dry completely and was in two minds not use the reviver. expected less and greatly surprised. Stage4. Applied Ultraproofer, this stage was for me the hardest as the liquid appeared to "bead" when applied, so needed a lot of careful application. Allowed to dry over night and the results of the whole process was awesome. (1 coat was slightly less than 500 ml). All in all, a nice job over a couple of days with perfect results, and this was my first attempt at doing my own "repair" work, but easy instructions, good product and a little care made it a "no fuss" project. Simple to use. My soft top wasn't really that dirty - even after 7 years as it spends the winter under a hard top. Thought it worth giving it a proper clean however before applying Ultraproofer. A great combination. Has come up like new. What more can I say? I have been using Renovo cleaner on my hoods for a few years now. My previous MX-5 had a vinyl hood, renovo worked well, then I bought a new MX-5 with a Fabric hood, the fabric renovo works a treat too. I always rinse off , leave to dry, hood looks fresh and ready for Renovo Ultra Proofer, watch the water run off during rain. Great products. Works very well and cleans top thoroughly. It does strip some of the proofing though, so I would advise re-proofing with Renovo proofer after use.